If you've been writing or pursing articles on writing for any length of time then you've probably heard all about the avoidance of adverbs. But why are they so bad? They're great in a pinch and they seem to convey just the thing you want to describe. But in reality they convey very little in terms of description. Don't get me wrong, I love using a good adverb when writing as much as the next person, but going back I always see how it weakens the story. Let's look at two examples of sentences to prove a point. "Alisha stepped onto the slippery ice and nearly fell over." "Alisha stepped onto the ice and lost her footing, one leg sprawled right while the other twisted left. She shot her arms out to her sides to gain balance and just avoided a pathetic flop onto her rear." The first sentence is okay. You know what's going on, but what does it really say? To me 'nearly' is the worst of the adverb sins becasue you don't always know what the something is that almost happened but didn't. You can see from the second sentence how much more visual your writing can be without the adverb. Here's a challenge for you, don't use adverbs for one week. I mean Everywhere. Every time you're itching to write that 'ly' stop yourself. In your blog posts, in your short stories, and in your novels. Come out the other end and see if it doesn't make you a better writer. I've been practicing this with my novel, but I'm going to bring it here now too. So if you see an adverb feel free to point it out, becasue we all want to be better writers. I'm not sure I could communicate effectively without adverbs. Which means that I should take your advice and attempt going without them for a few days. i don't have many writing pet peeves--just a few grammatical ones. Like saying "the girl that" instead of "the girl who". I'm not sure why that specific grammar issue bothers me so much. I wish it didn't because I see the error at least once a day. @joanna - Picture books are entirely different story! Adverb use is much more welcome there. And yes, the second sentence was much longer, but for a novel you have no pictures to lean on so it has to be longer, although this isn't the case every time. Sometimes an adverb can just be deleted. Thanks for visiting! 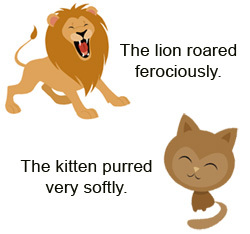 I loved your second visual - as if lions sometimes roar very softly and kittens sometimes purr ferociously. Point well made, Jennie. Great advice. One of my pet peeves is dialogue tags being used over and over again. I like to follow along with the conversation without seeing the author's hand in it like that. Great post! I had a finished 130,000 word manuscript that I had written for fun. Then I decided I wanted to pursue this author thing for real. Oh the horrors in that 130,000 word manuscript. Especially those darn adverbs! My pet peeve is comma usage and usually it's too many. The adverb crops up from time-to-time in my writing but I don't overuse them. They have their place. The thing that always blows my mind is how many more words it takes to not use adverbs. But you're right. It's much better writing. With my blog I tend to run wild with adverbs, however when it comes to writing I will limit myself. While revising I highlight all the adverbs and add a post-it rewriting it in the correct manner. You never realize how much depth is added if you just take the time to elaborate! Adverbs are not all evil. Some can be effective in prtraying the sense/feeling/description you wish to convey in your writing. Some words are open to varying interpretations, and adverbs sometimes help narrow it down. For instance, a whisper can be loud, harsh, or soft. I'd say pick your battles. Do away with unnecessary adverbs, and if you must employ one, make sure it is right one for your writing. Give adverbs an inch, and they'll infiltrate your entire manuscript. I use them when occasion permits, but that's not often. I plan on going back during my NaNoReviMo in November and do a huge adverb purge of my WIP. Your sentence comparison was great! I don't know if I can do it on my blog. It might make my head hurt to much. I try to catch myself whenever I use an adverb and stop to consider if that's really the best word I could be using--which it often isn't. My writing pet peeve is too many "?!"s. It just seems like way too much punctuation for emphasis that could more easily be accomplished by italics or different wording. I just hired an editor (waves to LTM) and she mercilessly (ha, ha) axed all my adverbs. And she was right, the sentences didn't need them. The problem I have with adverbs is that they're often not needed. That sentence is a good example--we all know ice is slippery (delete!). I've made it a habit to search for "ly" with the search function on Word so I can get rid of adverbs quickly while editing for that reason exactly. ROFL! I'd take you up on your challenge but I'm drafting and in draft mode I refuse to obey the rules, lol. That's what revisions are for. But of course I agree that fewer adverbs make for a stronger story! Have made four attempts to leave you a message, an for some reason my google account is allowing me to comment on a few blogs. I enjoyed your comments about adverbs. I write picture books, so eoonomy of words is important -- no room for adverbs. I do slip them in as I blog or write. Hard habit to break. Nice job! Crikey, the adverb is definitely "persona non grata" in the writing sphere! I think adverbs can be avoided in longer writing pieces, but it's difficult to leave them out completely in the 100-word challenge. I don't have one pet peeve about writing. There's a whole list that's topped with "your/you're" and "(should/would/could) of/(should/would/could) have," as well as punctuation errors and dialogue tags. But, but, adverbs are my friends! Actually, what I really overuse in my writing in perfect tense. I should stop that. The first time I heard this advice, my first reaction was to dismiss it. I mean, why restrict myself from using words? But, the more I looked at my wip (which was riddled with adverbs) I started to see that adverbs did indeed weaken my writing. Good advice, but so hard to follow! That sounds like a tough challenge! Thanks for the English lesson. High school and college writing classes were a long time ago, so I really do enjoy your little writing tips. My current pet peeve? My son's AP English teacher. (sorry, to offend teachers, but still ...) She's convincing them to overuse semi-colons and increase the length of their sentences ... to an extreme! I feel better now. Thanks for letting me vent.